I am not a swimmer. I was never on a swim team and the instruction I received was given at a very young age and not from a swim instructor. Hope that puts my swimming background into perspective. Since 2009, the moment I decided to jump into the fantastic world of triathlons, I have had several swim instructors. Some helped a little and others helped a lot. In the end I still found myself struggling through the swim leg of each race. I recently took a 2 day TI swim clinic to better understand how to move more efficiently through the water. I drove the 3.5 hours up to Bellevue, Washington. This was a great clinic…exhausting, but a great clinic. There were 4 of us who attended and we were all at different swimming levels (that is me on the far left in the picture below). The venue was awesome – We met at the PRO Sports Club. This place was an experience in itself. I am pretty certain you could get lost in this place. Seriously, I don’t know what sport it didn’t have. There were several areas I really liked though. The cardio theater was a sight to see (dim lights, movies, and cardio equipment all in one). The sauna and hot tub were greatly needed after each session in the pool to quickly warm up. Of course the pool area was awesome. I couldn’t imagine a better place to conduct the clinic. Now this couldn’t have been a great experience without a great instructor. Helenita Jacobs, did such a great job working through the techniques and honoring each of our own individual needs. Interestingly enough everyone who attended the clinic was a triathlete as well. If you are interested in taking one of her clinics take a look at her schedule here. I came into the clinic not really sure where I needed to make improvements. My typical swim training day consist of simply getting in the pool and swim; counting the laps until I reached my intended goal that day. What I found was I wasn’t getting any faster and I was getting frustrated. Saturday, we started out in the classroom to get acquainted with the method used by TI and why they use it. 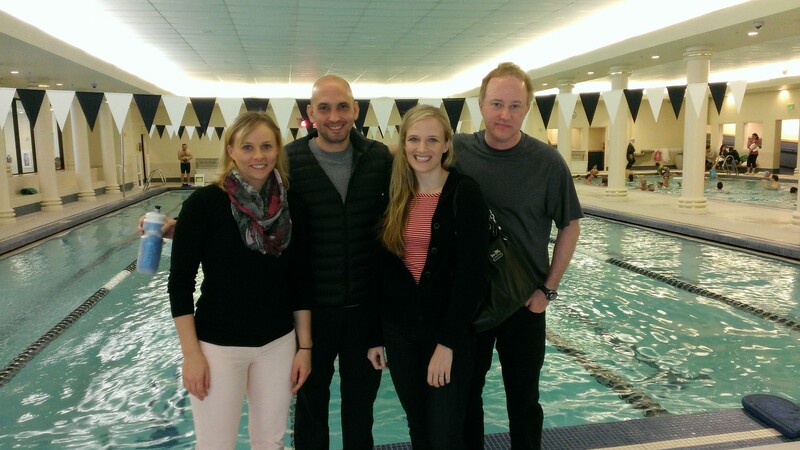 We then headed out to the pool for our video pre-clinic stroke analysis – We had to have a benchmark swim to see improvements right? I know I have been told in the past that I drop my elbow when I swim but I can honestly tell you that I didn’t know what that meant. Coaches and trainers would give me drills to correct the issue (finger tip drag, front scull, swim like you are rock climbing etc). Then I actually see myself in the benchmark video above dropping my elbow and it all makes sense. It was like a light bulb went off. That was way to easy!!!! You can also see several other correction in the video. I could be a little better balanced, I am not turning my body enough – By turning to a 45 degree angle my body wouldn’t be in the way of my stroke. In the video above you can see I am swimming a bit flat which forces my stroke to be cut short. This causes me to lift my hand out of the water too soon which shortens the distance I travel per stroke. We didn’t get into correcting your kick. That will come later after I have mastered the balance and stroke…but I can tell you from looking at the benchmark video above I have plenty of corrections to make. We were in the water a total of 3 hours on Saturday…but it felt like 6 hours. I had planned to cycle after the clinic but opted to head back to the hotel and rest. I can tell you that by the time we got to the post video I was pretty exhausted. You can see I have better balance but I am still dropping my elbow. I get what I need to be pay attention too so now it is time to correct it. What does all of this mean…. It has been two weeks since the clinic. Last week I worked through the drills I left with from the clinic. I would have to admit I was frustrated. I found myself struggling through my strokes and I also felt a bit of fatigue. I was also struggling to figure out how I was going to connect all that I learned on my own. Today I was scheduled to swim 1300 meters – no drills, just freestyle. I found myself connecting the strokes correctly~for the most part. Still far from perfection. I could feel a huge difference in my stroke…I even noticed that my kick was kinda just falling into place. I have been swimming at Matt Dishman community center in Portland, Oregon for over 1.5 years and at regular intervals (three times a week). Once completed with my training I don’t carry on conversations like the other ladies do in the changing room. They talk as if they have been close friends for at least a century. It is important that I give you this background because of what was shared with me this morning. As I was getting changed in the locker room, as a I do every Monday, Wednesday, and Friday a lady (one of the regulars) approached me and commented on how smooth my stroke was. “You make swimming look so easy and natural – you just glide so smoothly through the water”. Ha!!! that my friends is the best confirmation a lady could ask for! The TI method does work and all I need to do is stay committed to the drills and I will become an efficient swimmer. Thank you Swim Freedom for providing such an effective clinic!! !